A large, stately tree, commonly to 50 feet tall with a short, stout trunk of 4 feet or more in diameter, dividing into several large, twisting limbs that form a low, dense crown that can spread more than 100 feet, the limbs often touching the ground in open-grown settings. Occurs on well-drained soils in the southern coastal plain, from Virginia through the Atlantic and Gulf states and into Texas, west to the Balcones Escarpment and south to Hidalgo county. Widely planted as a landscape tree in Texas. Simple, alternate, evergreen, thick, and leathery; oval, oblong, or elliptical in shape, 2" to 4" long and 0.5" to 2" wide; smooth, glossy, and dark green above, pale and silvery white beneath. Leaves can sometimes be toothed, especially towards the tip. Borne in spring on the same tree, the male flowers on catkins up to 3" long, the female flowers on a peduncle 1" to 3" long in the leaf axils. 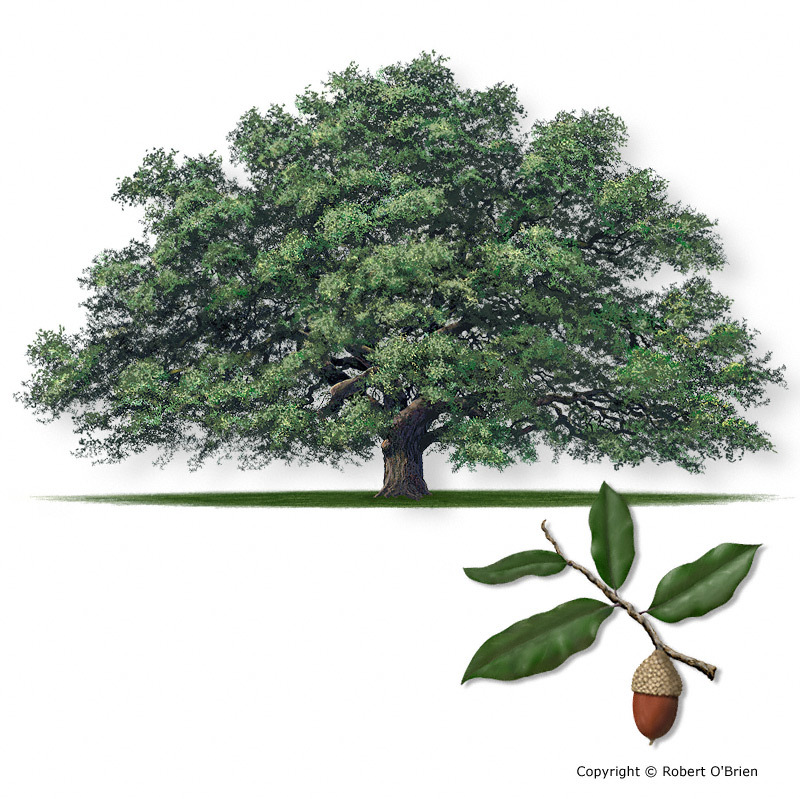 An acorn, requiring one year to mature, about 1" long and 0.5" in diameter, oblong, dark brown and shiny, set about one-half its length in a gray, downy cup that is borne on a long stem or peduncle. Dark brown, rough, and furrowed on trunk and large branches, developing very thick, interlacing ridges and deep furrows on older trees. Some specimens have thinner, paler, scaly bark. Very heavy, hard, strong and tough, light brown with nearly white, thin sapwood; formerly used in shipbuilding and for wagon wheel hubs. Now primarily sold as a landscape tree in the nursery trade. Texas live oak (Quercus fusiformis) occurs north and west of the Balcones Escarpment in Central Texas and tends to be smaller and multi-trunked. Mexican blue oak (Q. oblongifolia) is a rare evergreen oak that occurs in West Texas. Live oaks were once prized for their naturally curved limbs and trunk, used by shipbuilders in the 18th Century to fashion the ribs and planking of tall sailing ships, such as "Old Ironsides." Refitting that ship in the 1980's included specialty pieces cut from live oaks in Texas that had been killed by the oak wilt fungus.